For the first time in the city of Riyadh, the formation of O3 and its relationship with NO and NO2 (NOx) was investigated. Throughout the summer O3, NO, and NO2 were collected from three locations: residential, industrial, and rural areas. During the sampling period O3 concentrations exceeded 1-hour local standards a few times yet remained consistent with the standards most of the time. The O3 concentrations were observed highest in the rural location and lowest in the industrial area. The diurnal variation of NO followed a double peak: one in the morning and the other in the evening, representing the traffic pattern. Early morning NO peaks were observed in the rural location, which were attributed to the movement of NO from other locations. The O3 concentrations depicted typical pattern, increasing after sunrise and reaching its maximum during midday. The highest O3 concentrations were observed in the rural location followed by the residential and industrial. NO2 photolysis rates were 3-4 times higher compared to other similar investigations, potentially due to intense solar radiation. A strong negative correlation was observed between NOx and O3 values in the industrial location indicating photochemical activities around the industrial area were higher, likely due to additional NOx emissions from industries. Regression analysis of NOx and OX (O3 +NO2) indicated that in residential and industrial locations at nighttime there were large NOx independent regional contributions which is attributed to VOCs. The Weekend Effect was observed in the city potentially due to the production of the OH radical and subsequent reactions with VOCs implying that the area is VOC-sensitive. Photochemical reactions in the atmosphere produce several secondary pollutants, among which ozone (O3) is a major concern. Elevated levels of atmospheric O3 have been linked to adverse effects on human health (Jerrett et al., 2009; NRC, 2008; Ito et al., 2005; Brauer and Brook, 1997), damage to materials and manufactured goods (Ozen et al., 2002), and negative effects on crop yield (Ali et al., 2008) and vegetation and forests (Hogestt et al., 1997; Krupa, 1997). Due to its radiative forcing, O3 is identified as the third most effective greenhouse gas (Forster et al., 2007) and has been associated with climate change (Fiore et al., 2002). O3 is also known to facilitate the formation of hydroxyl radicals, which affect the oxidizing capacity of the atmosphere (Seinfield and Pandis, 2006). The oxides of nitrogen, NOx (NO+NO2), and Volatile Organic Compounds (VOCs) present in the atmosphere are usually regarded as major precursors of O3 (Seinfield and Pandis, 2006). The main factors that govern the buildup of O3 are abundance and the ratio of these atmospheric precursors, intensity of solar radiation, and the height of planetary boundary level. To control O3 pollution, it is necessary to reduce anthropogenic emissions of precursors, however, due to non-linear O3-precursor relationships, reducing precursors such as NOx does not always result in an O3 decrease (Fowler et al., 1997). Moreover, the changes in O3 and NOx potentially lead to increase in their background levels and these changes are highly dependent on local meteorology. So, for an effective mitigation plan, a thorough understanding of the relationship among O3 and NOx is needed. Studies have been done to investigate this relationship and it has been shown that this non-linear relationship is highly dependent on ambient meteorology and local conditions (Notario et al., 2012; Han et al., 2011; Mazzeo, 2005). The problem of O3 is generally experienced in large cities, and the city of Riyadh in Saudi Arabia is no exception. Recent studies show the declining trend of air quality (Alharbi et al., 2015; Meo et al., 2013; Rushdi et al., 2013), and Riyadh is reported to be one of the top 10 cities in the world with urban smog problems (DW, 2015). The annual average UV radiation in Riyadh was reported close to 300 Wh/m2 and were observed to be higher than other regional cities (Elani, 2007). 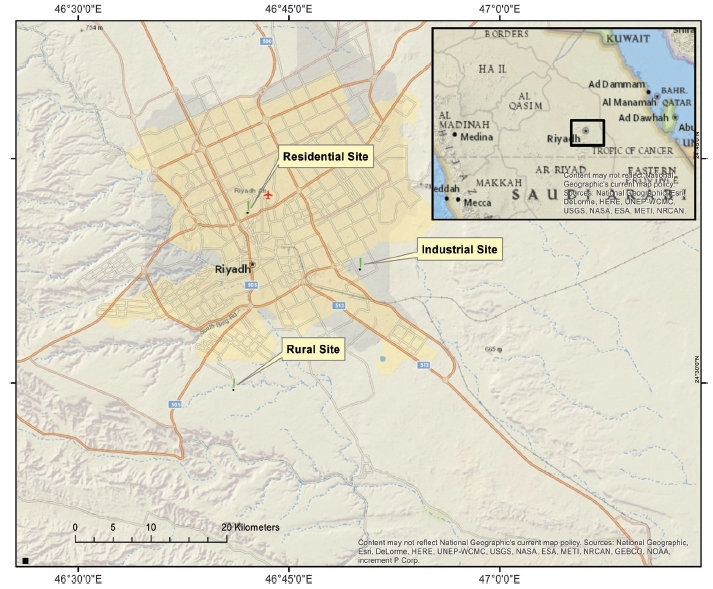 There has not been a study that examines O3 formation in Riyadh; however, studies have been done in neighbouring cities. Low levels of O3 and a significant weekend effect were reported in Jeddah (Porter et al., 2014), moderate O3 values and weekend effect were observed in Yanbu (Al-Jeelani, 2014), and increasing trend of O3 values was observed in Makkah (Munir et al., 2013), and the city of Cairo reported high O3 concentrations (Khoder, 2009). Hassan et al. (2013) noted an inverse relationship between O3 and NOx and high O3 values at rural locations in Jeddah. Regionally, severe O3 pollution was reported in the Persian Gulf and due to dry local climate, the pollution is likely to get worse (Lelieveld et al., 2009). Another study found that extreme pollution events, with O3 mixing ratios exceeding 150 nmol/mol can occur regularly over the Arabian Gulf (Smoydzin et al., 2012). Considering the fact that Riyadh depends primarily on private transportation and has a number of industries and petroleum refineries, high emissions of NOx are expected. Because the weather conditions are severe, particularly high solar radiation and temperature, studying the formation of O3 and its relationship with NOx assumes high importance. Therefore, the main objectives of this paper are to 1) Assess the O3 and NOx concentrations, 2) Study the diurnal variation of O3 and NOx, 3) Investigate the relationship between O3 and NOx, 4) Identify NOx’s dependent and independent contributions, and 5) Examine the weekend effect. Riyadh is the capital city of Saudi Arabia with a population of over 5 million and one of the largest cities in the region. It consists of a large number of industries in addition to the dense residential areas. With limited public transportation, the population largely depends on private vehicles for commute. To understand the formation of O3 and its precursors, three stations (Fig. 1) were selected. The first station was located in the middle of the selected residential area dominated by heavy traffic movement, the second station was in the middle of an industrial area where several industries exist including a petroleum refinery. The third, a rural station, was located in the outskirts of the city where there was low traffic movement. The stations are approximately 20 km apart from each other. The analyses presented in this paper are based on four months of sampling period from Jun 2012 to Sep 2012 as the data were collected only during this period. Locations of the monitoring sites. The instrument used in collecting NOx was a CO-Dual Beam based on chemiluminescence (HORIBA APNA-370) with lowest detectable limit of 1 ppb. O3 was monitored using O3-UV photometer (HORIBA APOA-370) with a lowest detectable limit of 4 ppb. M, usually O2 or N2, represents a molecule that stabilizes O3 by absorbing excess vibrational energy. These reactions form a cycle with no net chemistry, the first two reactions produce O3 and third one destroys it. These reactions therefore represent a closed system in which NOx (NO+NO2) and OX (O3+NO2) relate separately and the rate of these reactions plays a major role in the formation of O3 as explained in the following statements (R1 and R2). Seinfeld and Pandis (2006) suggest the relationship of k3 with the temperature as given in Eq. (8). The oxygen (O) atom in an excited state that is released as a result of O3 photolysis, reacts with water (H2O) and forms OH radicals. These OH radicals react with hydrocarbons (R) resulting in the conversion of NO to NO2 as shown in the Eqs. (9-10). Thus, both NO and hydrocarbons play an important role in the formation and destruction of O3 in the atmosphere. The temperatures observed at the three locations were similar during the sampling period. The minimum and maximum temperatures were in the vicinity of 25°C and 50°C, respectively. The winds in the industrial, and rural locations showed similar patterns, however at the residential site the winds were calmer. The maximum wind speeds were 10.9 m/s, 11.9 m/s, and 11.1 m/s at the residential, industrial, and rural locations respectively. The winds usually remained in the range of 2.5-4.5 m/s, 4.5-6.5 m/s, and 2.5-4.5 m/s in the residential, industrial, and rural sites. At the residential and rural locations winds were observed to be blowing from all directions; but predominantly from the northeast. At the industrial location, winds were however predominantly blowing from the north and northeast as evident from the wind-rose diagram shown in Fig. 2. The relative humidity values were in the range of 25-35% at all three sites. Wind rose diagrams (winds coming from) at residential, industrial and rural locations. The ambient air quality is regulated by Presidency of Meteorology and Environment (PME) in Saudi Arabia. The prescribed 1-hour and 8-hour standards for O3 are 120 ppb and 80 ppb respectively, and the 1-hour standard for NO2 is 350 ppb (PME, 2012). In order to study the spread of the data, O3 and NO2 hourly concentrations are presented as box plots (Fig. 3). As shown in the figure, 75th percentile O3 concentrations (ppb) were approximately 50, 42, and 70 for residential, industrial, and rural locations respectively. O3 concentrations were observed relatively high in the rural location followed by the residential and then the industrial. Box plots for O3 and NO2 concentrations at residential, industrial, and rural locations (based on four months of data collected during Jun 2012 to Sep 2012). For NO2, the 75th percentile concentrations (ppb) were 30, 35, and 20 for residential, industrial, and rural locations respectively, as shown in Fig. 3. Higher concentrations of NO2 in the industrial location relative to other locations, imply that there are industrial emissions of NO/NO2 in addition to automobile emissions. At all locations, the NO2 concentrations stayed below the PME prescribed standards. Table 1 displays the percentage frequency distribution of O3 concentrations for the three locations. In the residential location, there were about 15% of O3 concentrations that exceeded 80 ppb and about 2% exceeded 100 ppb. The industrial location had very few exceedances of 80 ppb and no exceedance of 100 ppb. However, the rural location reported over 2% O3 concentrations exceeding 120 ppb, in addition to a large number of exceedances above 80 ppb. Fig. 4 shows the average O3 concentrations at the three locations compared with neighboring cities. Riyadh and Jeddah represent average daily values while others are annual averages. Riyadh values are based on current measurements (Jun-Sep) and Jeddah values are based on annual measurements (Porter et al., 2014). Percentage frequency distribution of hourly mean O3 concentration at three locations (based on four months of data collected during Jun 2012 to Sep 2012). Average daily levels of O3 concentration in Riyadh along with values at selected cities for comparison. Jeddah value represent average daily values (Porter et al., 2014). Yanbu (Al-Jeelani, 2014), Abu Dhabi (Al Katheeri, 2012), and Cairo (Khoder, 2009) values represent annual averages. Though the O3 concentrations are highest in the rural location, those in the residential and industrial locations are comparable to neighboring cities. Since the values for other cities are annual average they cannot be directly compared, however, they are presented in the plot for illustration. Overall, the O3 concentrations at all three locations were just below the prescribed limits for most of the time, however exceeded 1-hour limits a few times. Fig. 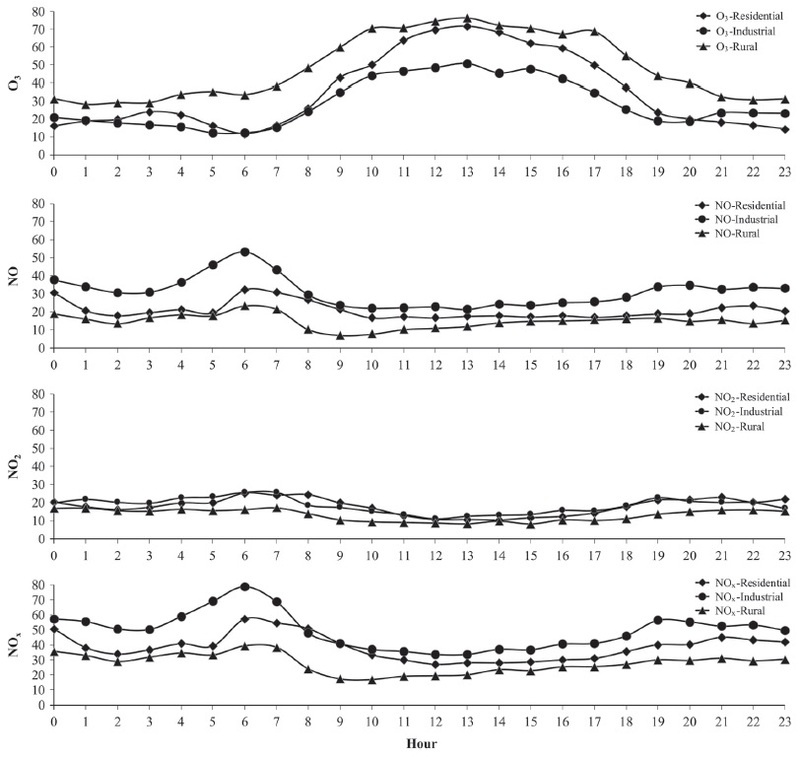 5 illustrates diurnal patterns of O3, NO, NO2, and NOx concentrations at residential, industrial, and rural locations. The diurnal pattern of the primary pollutant NO at residential and industrial sites followed a double peak, one in the morning and the other in the evening. The morning peak occurred around 06:00-07:00 local time (LT) coinciding with rush hour traffic. The average peak concentrations in the residential and industrial sites were 32 ppb and 53 ppb respectively. After the morning peak the NO steadily decreased indicating the photochemical conversion of NO to NO2 until late in the evening where it peaks again around 20:00 LT. The evening peaks in the residential and industrial areas were 18 ppb and 34 ppb respectively. Nighttime NO concentrations remained steadily low. As noted, at the industrial site NO concentrations are slightly higher than the residential site. The NO concentrations at the rural site remain low during the day, it peaks in the early morning to 23 ppb, and this peak appears to be coming from the industrial and residential areas due to wind conditions as depicted in the wind rose diagrams (Fig. 2). Diurnal variation of average O3. NO, NO2, and NOx concentrations (ppb) at three locations. The NO2 concentrations showed a similar pattern to NO, however both the morning and evening peaks have a lag time of 1 hour with respect to NO. This lag time can be explained by photochemical reaction which converts NO to NO2. The morning and evening peaks were around 25 ppb and 20 ppb respectively in all locations. Both residential and industrial locations showed similar patterns and magnitude. The rural location showed high concentrations of 17 ppb in morning, then dropping to 8 ppb at noon and subsequently increasing slightly towards evening. The NO2 concentrations were lower at the rural location than the concentrations at the residential and industrial. Higher NO and NO2 concentrations at the industrial location could be explained by emissions from industries, especially a petroleum refinery, in addition to traffic emissions. The concentrations of NOx at all locations followed NO and NO2 patterns with double peaks. The industrial location had higher concentrations than the residential location with morning and evening peaks of 80 ppb and 60 ppb respectively. The residential location peaks were 60 ppb and 45 ppb in the morning and evening respectively. The morning and evening peak concentrations at rural locations were 39 and 30 ppb respectively which are less than both industrial and residential values. The daily variation of O3 concentrations was influenced by traffic emissions, photochemical activity, and the height of the planetary boundary level, as also reported by other studies (Notario et al., 2012; Han et al., 2009; Jenkin et al., 2000). The O3 concentrations gradually increased after sunrise and reached their maximum at noontime and decreased towards sunset and remained low throughout the night. The daily maximum occurred around 13:00 LT at all three locations. The highest O3 concentrations were observed in the rural location followed by the residential and then the industrial. High rural concentrations can be explained by the phenomenon of transport of NO2 and mixing of air masses due to meteorological conditions; this condition has been reported in other regions (Han et al., 2013; Notario et al., 2012; Geng et al., 2008). Studies have been done to analyze O3 and its precursors in the Arabian region (Al-Jeelani, 2014; Porter et al., 2014; Khoder, 2009), but none of the studies explain the early morning O3 loss. As observed from Fig. 5, there is a reduction of O3 early in the morning. This early morning O3 loss can be explained as follows. The source of NO is primarily in the residential and industrial locations; this NO reacts with O3 to form NO2 (Eq. 3), resulting in the reduction of O3 concentrations. Since sunlight is low in the early morning, there is little photochemical breakdown of NO2 and this is transported over to rural locations. Photochemical activities increase with sunlight, thus NO2 acts as an agent to the increase in O3 concentrations in the rural location (Eqs. 1-2). NO2 could possibly be transported to rural location from other areas as the predominant wind direction is from northeast particular from industrial location (Fig. 2). This can also be explained by calculating O3 tendency (d[O3]=O3[t+1]-O3[t]). Fig. 6 illustrates the O3 tendency for the three locations. The positive values of O3 tendency indicate that the O3 chemical production becomes a dominant factor in controlling O3 concentrations while negative values mean O3 destruction plays a major role. As seen in the figure, negative O3 tendency is observed in the residential location at early morning while positive tendency is noticed at the rural location at the same time. Daily variation of O3 tendency at different locations. The diurnal variation of NO2 photolysis rate per minute (J1) calculated based on Eqs. (7-8) at the three locations is shown in Fig. 7. NO2 photolysis rates follow the O3 formation pattern for all three sites. The maximum/minimum photolysis rates (min-1) in the rural, residential and industrial locations were 4.56/0.45, 4.29/0.10, and 3.54/0.45 respectively. These values are 3-4 times higher than those of a similar study (Notario et al., 2012). These relatively elevated rates can be attributed to the high solar radiations in Riyadh. An early morning high NO2 photolysis at the rural location presents another reason for early morning O3 loss at the residential location. Daily variations of mean values of J1 (min-1). Fig. 8 illustrates the scatter plots NO, NO2, and O3 versus NOx along with the fitted polynomial curves for daytime (07:00-18:00) and nighttime (19:00-07:00). Due to photochemical activities in the day, it is expected that daytime pattern is different from nighttime. 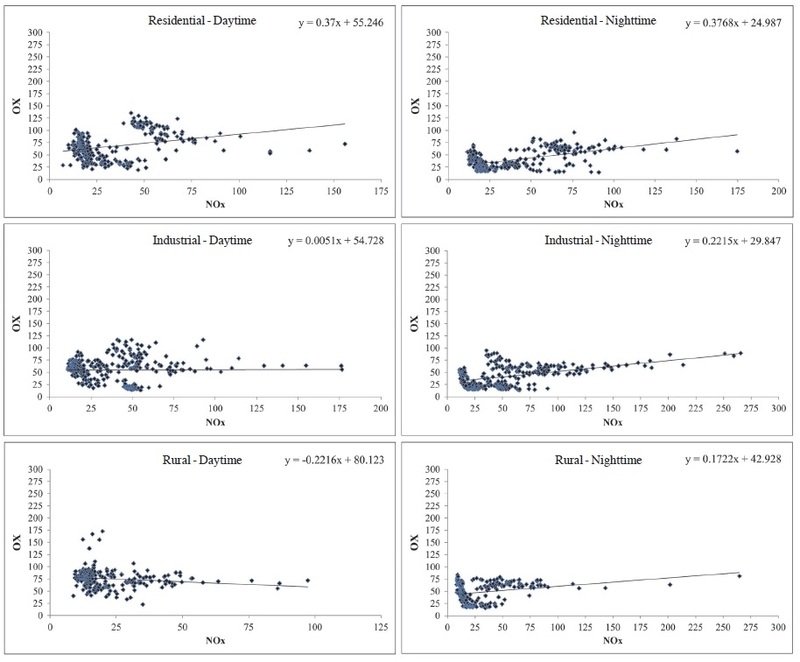 Variation of NO, NO2, and O3, versus NOx concentrations and polynomial fit curves during day (left) and night time (right) for residential (a), industrial (b) and rural (c) areas. As depicted in the figure, during the daytime there is a general tendency of O3 to decrease with NOx, and the dispersion is large at the lower NOx concentrations. As the photochemical activity pauses towards nighttime, O3 concentrations remain constant despite increase in NOx. A relatively stronger negative correlation was observed between NOx and O3 values in the industrial location (r=- 0.82) while weak correlations were noticed in the residential (r=- 0.45) and rural locations (r=- 0.22). This indicates that the photochemical activities around the industrial area were higher, potentially due to the greater emissions of NOx due to traffic as well as from the industries located in the area. In the rural location, there was a large dispersion in O3 concentrations, however lower concentrations were observed when NOx values were elevated. The maximum NO, NO2, and O3 concentrations observed during daytime/nighttime in the residential location were 100/120 ppb, 71/60 ppb, and 116/88 ppb respectively; in the industrial location, the maximum concentrations were 130/190 ppb, 81/86 ppb, and 98/78 ppb respectively; in the rural location, they were 65/196 ppb, 57/68 ppb, and 160/80 ppb. In view of these results, we can infer that the NO concentrations were observed higher during the night in the industrial location and that day and night showed similar NO2 concentrations at all locations. A polynomial fit was found suitable for the NO, NO2, NOx, and O3 scatter plots as shown in Fig. 8. The photo-stationary state of NOx concentrations as illustrated in Eq. 6 and Eq. 7 can be inferred from these curves. During the day, the NOx concentrations for NO and O3 intersects were 85 ppb, 55 ppb, and 62 ppb for residential, industrial, and rural locations, respectively. This implies that at these NOx concentrations, O3 concentrations are higher than NO values, whereas NO concentration exceeds O3 at higher NOx levels. For example, at the residential site at the concentration of NOx equal to 85 ppb, O3 concentrations were higher than NO, however O3 concentration decreases with the NOx value greater than 85 ppb. Similar analysis of NO, NO2, NOx, and O3 scatter plots was performed for the NO2 and O3 intersects. During the day, the NOx concentrations observed were 90 ppb, 70 ppb and 95 ppb for residential, industrial, and rural locations respectively. In this case, similar behavior is observed for industrial and residential locations while NOx intercept is lower for the rural location. The patterns of O3 and its precursor discussed here match with that of the other studies (Notario et al., 2012; Mazzeo et al., 2005; Clap and Jenkin, 2001) however, the concentrations are higher in this study. Local and regional contribution of OX (O3+NO2) can be identified from the regression analysis of NOx and OX, the slope of which indicates the local OX contribution while the intercept represents the NOx independent regional contribution (Notario et al., 2012; Mazzeo et al., 2005; Clapp and Jenkin, 2001). Regional contribution means NOx independent, and local contribution means NOx dependent. Fig. 9 shows the variation of average OX concentration with respect to NOx levels as observed during day and night in the three different locations. Regression analysis of NOx vs. OX for day (left) and nighttime (right) at three locations. In the residential location, the slope of the NOx and OX curve is same during the day and night which is 0.37. This implies that the local NOx levels remain almost constant during day and night. The local contribution of NOx during the day due to photolysis reactions balances out with the buildup of NO during late evening traffic activities, hence overall local NOx levels remain constant all over the day. In the industrial location, the slope is lower during the day when compared to night implying there are high NO emissions during the night. This may be due to increased traffic activities around the the industries that normally operates during night as well. In the rural location, close to zero local emissions were observed; this is in line with the characteristics of the area where traffic emissions are not expected. However, there is an increase of NO concentrations in the night, most probably it is due to the buildup from nearby residential and industrial areas. The intercept during the day were generally greater than that of night indicating there was large NOx independent regional contribution. Also, it is noticed that there are higher intersect values in the rural location indicating regional contribution is major source at this location. It is implied from the above discussion that NOx independent contribution is generally greater indicating larger contributions from NOx independent sources. While there is the possibility of regional contributions, it is highly likely that these NOx independent contributions are from VOCs present in the atmosphere, which interfere in the photochemical cycle (Eqs. 9-10). The average diurnal difference between weekend and weekday (weekend-weekday) concentrations of NO, NO2, and O3 was calculated for the three locations as plotted in Fig. 10. It shows that the difference is positive for O3 and negative for NO and NO2. Reduction of NO concentrations during weekend is manifestly due to reduction of traffic emissions. 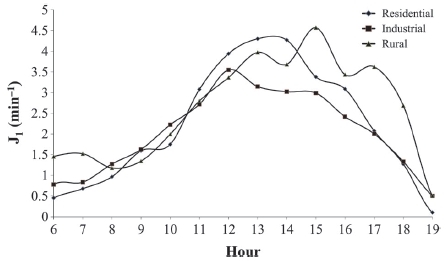 In the residential area, weekend NO concentrations were observed to be lower in the morning, however increased during the evening and night contrary to other studies (Han et al., 2011; Khoder, 2009; Debaje and Kakade, 2006). This pattern probably reflects the local traditions of the city where there are increased weekend activities during the evenings. Diurnal weekend and weekday (weekend-weekday) differences of NO, NO2, O3 concentrations at three locations averaged during the sampling period. In the industrial site, there was a distinction between weekend and weekday NO concentrations during corresponding times of the day. There were consistent negative differences of NO concentrations all over the day, indicating that during the weekend there is a considerable reduction of traffic emissions as well as emissions from industries. This shows a significant reduction in traffic activities around the industrial areas during weekends, most of the industries work at full scale during weekdays and have reduced activities during weekends. It also implies NO concentrations are primarily due to traffic emissions, though some contribution from the industries cannot be ruled out. The maximum weekend-weekday difference of NO at the residential, industrial, and rural locations were 10 ppb, 16 ppb and 15 ppb respectively. These differences are higher than other studies (Han et al., 2013; Khoder, 2009; Geng et al., 2008) indicating increased levels of automobile pollution in Riyadh city. The gain of O3 concentrations during weekend is generally called the weekend effect. The reasons for this effect are the sensitive relation of O3 formation to VOC, difference in timing of NOx emissions, carryover of O3 and its precursors’ concentration from the day before the weekend, and increased weekend emissions (CARB, 2003). This weekend effect could be explained for Riyadh city as follows. Observing the NO2 pattern, it is consistently low during the day indicating that NO2 is transformed resulting in increased production of OH (Eq. 9). The OH radical reacts with VOCs (Eq. 10) present in the atmosphere converting NO to NO2. This NO2 facilitates the formation of O3 (Eqs. 1-2), thus resulting in the build-up of O3 concentrations during weekends. This suggests that the formation of O3 in Riyadh city is clearly under VOC-sensitive regime. For the first time the formation of O3 and its relationship with NO and NO2 was investigated in Riyadh. Throughout the summer O3 and NOx were collected from three locations; residential, industrial, and rural. The O3 concentrations at all three locations were just below the prescribed limits for most of the time, however they exceeded 1-hour limits a few times. The O3 concentrations were observed relatively higher in the rural location, and the industrial location reported the lowest. Average O3 concentration was compared with the available values for neighbouring cities; it was found that the Riyadh’s measurements were higher. The NO2 concentrations were high in the industrial location indicating industries as a big source of NO2 in addition to the automobile emissions, however emissions remained below standards at all times. 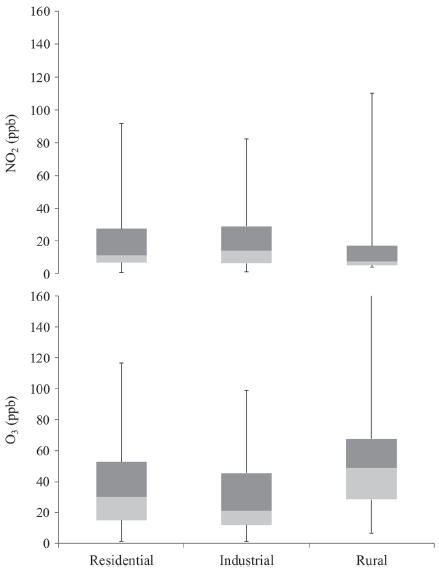 Diurnal variations of NO, NO2, NOx, and O3 were studied. The primary pollutant, NO, followed a double peak: first in the morning and the second in the evening representing the traffic patterns. Higher peak concentrations of 53 ppb were observed in the industrial location compared to the residential peak of 32 ppb. This implies the sources of NOx emissions include industries such as petroleum refining present in the industrial area. Early morning NO peaks were observed in the rural location mainly due to the movement of NO from other locations. Due to photochemical activities, the concentrations of NO remained low during the day. The NO2 concentration showed a similar pattern to NO, however both the morning and evening peaks had a lag time of 1-hour with respect to NO. This lag time can be explained by a photochemical reaction which converts NO to NO2. The O3 concentrations depict the typical pattern, increasing after sunrise and reaching their maximum at midday and decreasing towards sunset and remaining low at night. The highest O3 concentrations were observed in the rural location followed by the residential and industrial areas. NO2 photolysis rates were calculated based on the collected data and the rates were 3-4 times higher when compared to other studies, potentially due to intense solar radiations. 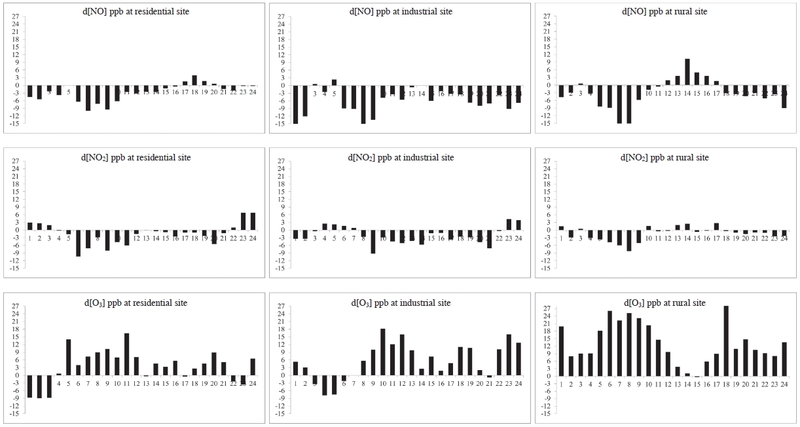 A strong negative correlation was observed between NOx and O3 values in the industrial location indicating the photochemical activities around the industrial area are higher relative to other locations, potentially due to additional NOx emissions from industries. Studying the polynomial fit of the O3-NOx relationship revealed that among the three, the industrial location appears to reach a photo-stationary state earlier, which is the reason O3 concentrations are generally lower, implying industries and petroleum refining present at this location emit considerable NO concentrations. Regression analysis of NOx and OX indicate that in residential and industrial locations during night there are large NOx independent regional contributions. Regional contributions of NOx cannot be ruled out; however, it is highly likely that these NOx independent contributions are from VOCs present in the atmosphere, which interfere in the photochemical cycle. Higher concentrations of O3 were observed during the weekend, generally known as the weekend effect. While there are several reasons explained in the literature for this effect, it appears that in Riyadh this is due to the production of OH radicals and subsequent reactions with VOCs. This also implies formation of O3 in Riyadh is under VOC-sensitive regime. In conclusion, the concentrations of O3 and NOx in Riyadh do not in general exceed the standards, however attention is required due to several values being too close to safety limits. Mitigating NOx emissions might invariably produce more O3 due to the complex O3-NOx photochemical relationship and the role of VOCs. Since it has been identified that the city is under VOC-sensitive regime, further analysis using VOC data is highly recommended. The present study is based on four months of data collected during summer, 2012; it would also be valuable to study the patterns during the winter months. We gratefully acknowledge the financial support of King Abdulaziz City for Science and Technology (KACST) under grant number 32-594. Brauer, M., Brook, J.R., (1997), Ozone personal exposure and health effect for selected groups residing in the Fraser Valley, Atmospheric Environment, p2113-2121. CARB, (2003, ‘The ozone weekend effect in California’, Staff Report, The Planning and Technical Support Division, The Research Division, California Air Resources Board, Sacramento, CA, 30th), May. Clapp, L.J., Jenkin, M.E., (2001), Analysis of the relationship between ambient levels of O3, NO2 and NO as a function of NOx in UK, Atmospheric Environment, 35, p6391-6405. DW, (2015), Pollution, top 10 worst cities for smog, (http://www.dw.de/top-10-worst-cities-for-smog/g-17469135) link accessed on June 25, 2015. Forster, P., Ramaswamy, V., Artaxo, P., Berntsen, T., Betts, R., Fahey, D.W., Haywood, J., Lean, J., Lowe, D.C., Myhre, G., Nganga, J., Prinn, R., Raga, G., Schulz, M., Dorland, R.V., (2007), Changes in Atmospheric Constituents and in Radiative Forcing. In: Climate Change 2007: The Physical Science Basis. Contribution of Working Group I to the Fourth Assessment Report of the Intergovernmental Panel on Climate Change, Cambridge University Press, Cambridge, United Kingdom and New York, NY, USA. Fowler, D., Coyle, M., Anderson, R., Ashmore, M.R., Bower, J.S., Burgess, R.A., Cape, J.N., Cox, R.A., Derwent, R.G., Dollard, G.J., Grennfelt, P., Harrison, R.M., Hewitt, C.N., Hov, O., Jenkin, M.E., Lee, D.S., Maynard, R.L., Penkett, S.A., Smith, R.I., Stedman, J.R., Weston, K.J., Williams, M.L., Woods, P.J., (1997), Ozone in the United Kingdom. Fourth Report of the UK Photochemical Oxidants Review Group, Department of the Environment, Transport and the Regions, London, Published by the Institute of Terrestrial Ecology, Bush Estate, Penicuik, Midlothian, EH26 0QB, UK. Han, S.Q., Bian, H., Tie, X.X., Xie, Y.Y., Sun, M.L., Liu, A.X., (2009), Impact of nocturnal planetary boundary layer on air pollutants: measurements from a 250 m tower over Tianjin, China, Journal of Hazardous Materials, 162, p264-269. Hogsett, W.E., Weber, J.E., Tingey, D.T., Herstrom, A.A., Lee, E.H., Laurence, J.A., (1997), An approach for characterizing tropospheric ozone risk to forests, Environmental Management, 21(1), p105-120. Ito, K., De Leon, S.F., Lippmann, M., (2005), Associations between ozone and daily mortality: analysis and meta-analysis, Epidemiology, 16(4), p446-457. Jerrett, M., Burnett, R.T., Pope, A., Ito, K., Thurston, G., Krewski, D., Shi, Y., Calle, E., Thun, M., (2009), Long-term ozone exposure and mortality, New England Journal of Medicine, 360, p1085-1095. Krupa, S.V., (1997), Air Pollution, People and Plants, American Phytopathological Society Press, p197. Mazzeo, N.A., Venegas, L.E., Choren, H., (2005), Analysis of NO, NO2, O3 and NOx concentrations measured at a green area of Buenos Aires City during wintertime, Atmospheric Environment, 39(17), p3055-3068. 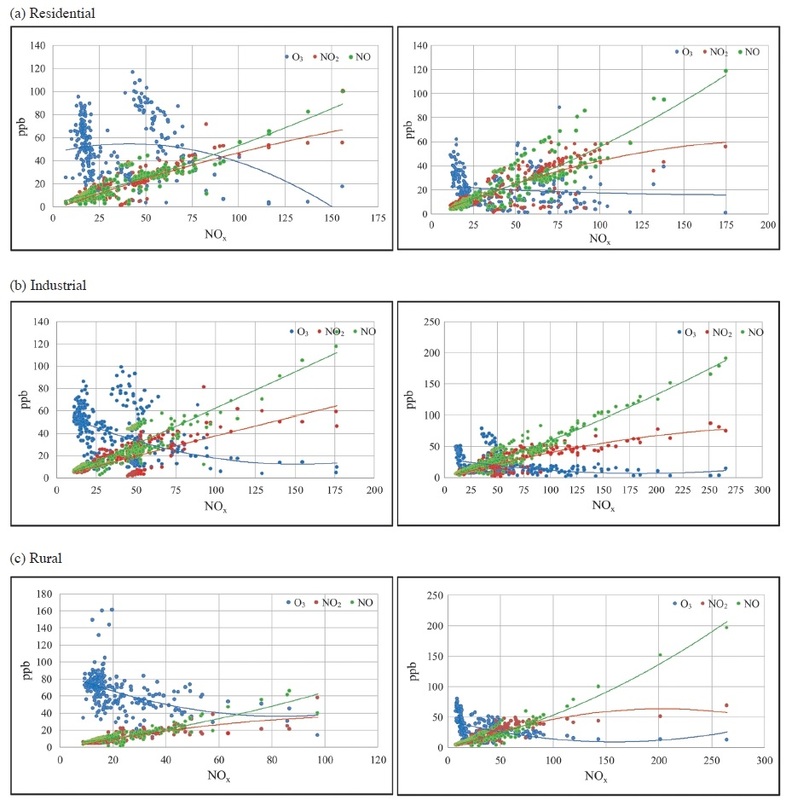 Notario, A., Bravo, I., Adame, J.A., Diaz-de-Mera, Y., Aranda, A., Rodriguez, A., Rodriguez, D., (2012), Analysis of NO, NO2, NOx, O3 and oxidant (OX=O3 +NO2) levels measured in a metropolitan area in the southwest of Iberian Peninsula, Atmospheric Research, 104-105, p217-226. NRC, (2008), Estimating Mortality Risk Reduction and Economic Benefits from Controlling Ozone Air Pollution, National Research Council (NRC) of the National Academies, Committee on Estimating Mortality Risk Reduction Benefits from Decreasing Tropospheric Ozone Exposure, Washington, DC. Presidency of Meteorology and Environment (PME), (2012), Environmental Standards - Ambient air quality standards, (http://www.pme.gov.sa/en/En_EnvStand19.pdf) link accessed on 11 Nov, 2015. Seinfeld, J.H., Pandis, S.N., (2006), Atmospheric Chemistry and Physics: From Air Pollution to Climate Change, Second ed., John Wiley & Sons, Inc.
Smoydzin, L., Fnais, M., Lelieveld, J., (2012), Ozone pollution over the Arabian Gulf - role of meteorological conditions, Atmospheric Chemistry and Physics Discussions, 12, p6331-6361.